Swiss Henry Dunant, founder of the YMCA and Red Cross, was recipient of the first Nobel Prize in 1901. He was an excellent student of Bible prophecy. This put him in the same league with other great visionaries such as Martin Luther, Zwingli, Paracelsus, Isaac Newton, Kepler, Boyle, Einstein, and Hans Hauge of <?xml:namespace prefix = st1 ns = "urn:schemas-microsoft-com:office:smarttags" />Norway. Visionaries such as Dunant drew up charts of the past and future based on forecasts made by the inspired writers of the various Bible books. 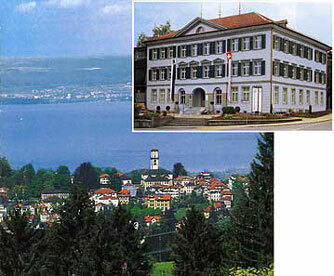 There is a wonderful Henry Dunant Museum in the beautiful village Heiden overlooking the Bodensee in northeast Switzerland. Guided tours are given in English and German, and there is a 45 minute movie on Dunant history as well. Das Henry-Dunant-Museum ist der Persönlichkeit und dem Lebenswerk Henry Dunants (1828-1910) gewidmet. Im Museum erleben Sie den erstaunlichen Lebenslauf des bekannten Philanthropen und erhalten ein neues Bild dieser faszinierenden Persönlichkeit des 19. Jahrhunderts. Sie erfahren auch von Projekten Dunants für eine menschenwürdigere Welt, die erst lange nach seinem Tod realisiert wurden und sogar für Probleme unserer heutigen Zeit noch Lösungsvorschläge erhalten.